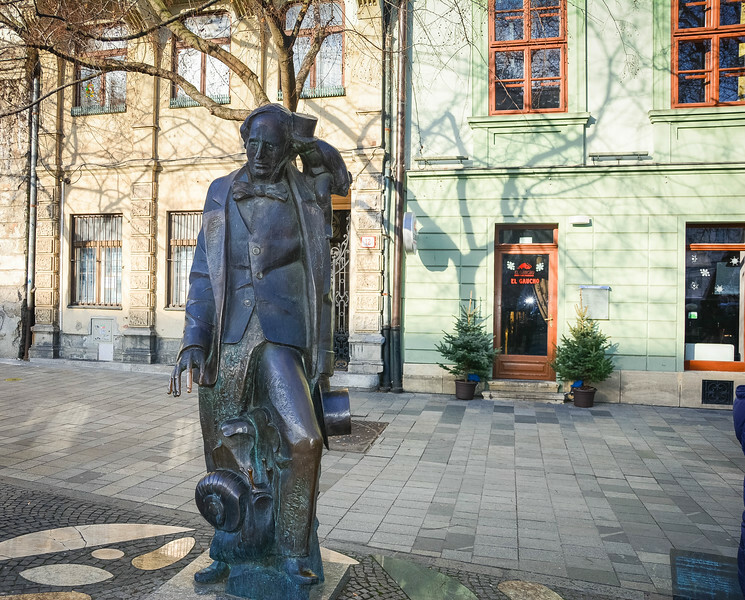 Free Bratislava Walking Tour - Is it Worth the Time and Effort? 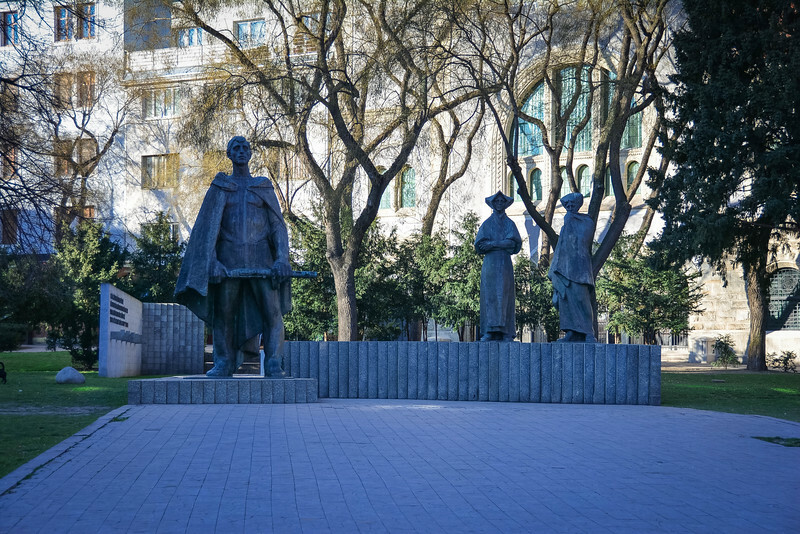 Home Slovakia Free Bratislava Walking Tour – Is It Worth the Time and Effort? 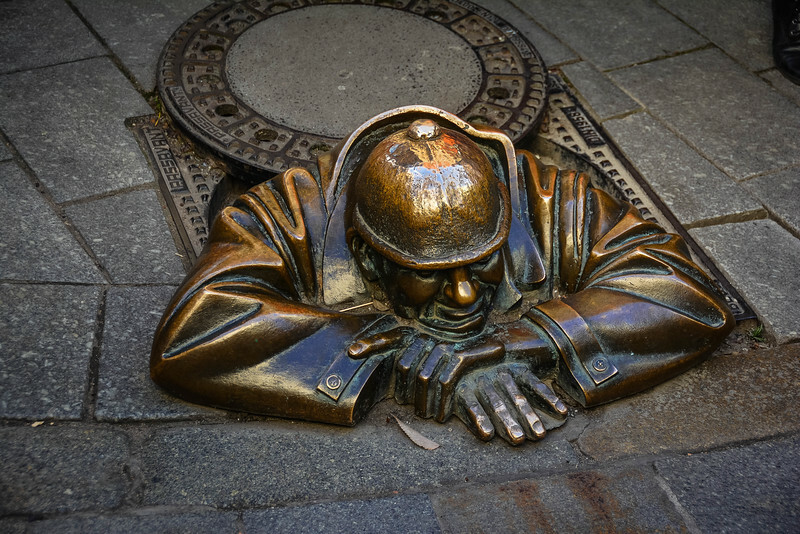 Free Bratislava Walking Tour – Is It Worth the Time and Effort? 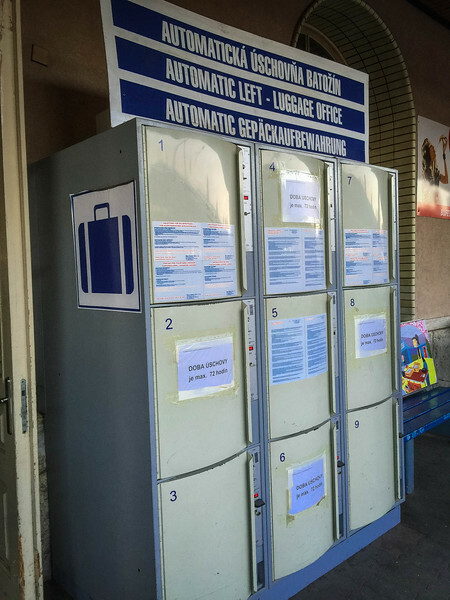 If you are thinking about visiting Slovakia, or specifically Bratislava, you may have heard a lot of stories suggesting that this part of Europe is simply not worth your time and effort. Well, let’s start by encouraging you to ignore all of those stories and listen to what we have to say because after our experience in Bratislava we can 100% confirm that this is DEFINITELY worth exploring! 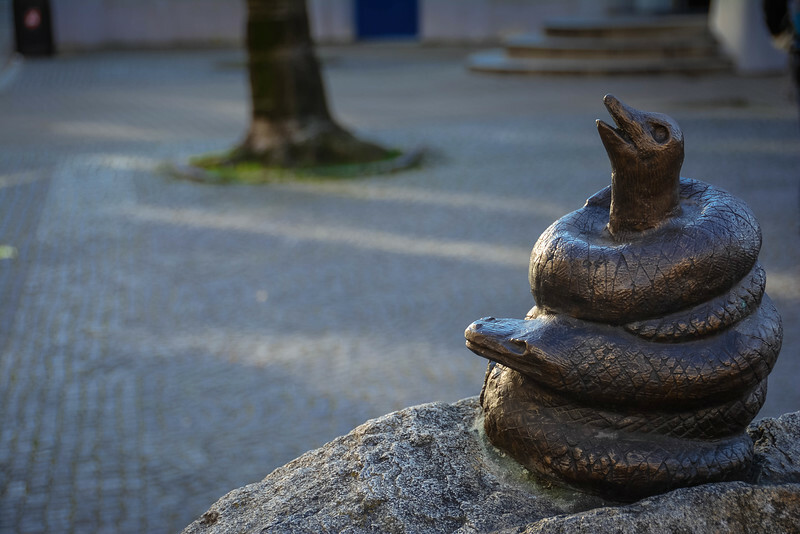 A free Bratislava walking tour is certainly one of the best ways to visit many of the highlights and iconic landmarks in the Slovak capital. Our trip to Bratislava started in Vienna as we boarded an early morning train heading for the Slovak capital. I will openly admit that both of us were a little skeptical about this trip but excited at the same time as this was one of those countries off the beaten path that most tourists probably don’t think about visiting. Let’s take a step back and look at the stereotypes that are floating around about Bratislava. Yes, Bratislava is the capital of Slovakia which was formerly part of Czechoslovakia before both countries became independent nations in 1993. Before going into too much detail, Bratislava and the country of Slovakia as a whole suffer from a lot of corruption which is definitely one of the main problems here, but the stereotypes that I am sure many of us have seen portrayed on movies like Eurotrip and Hostel are far from the truth! Planning a trip to Bratislava and worried that you may be the next tourist kidnapped? Please, please don’t worry about this! The chances of winning the lottery are about as high as this happening to you. 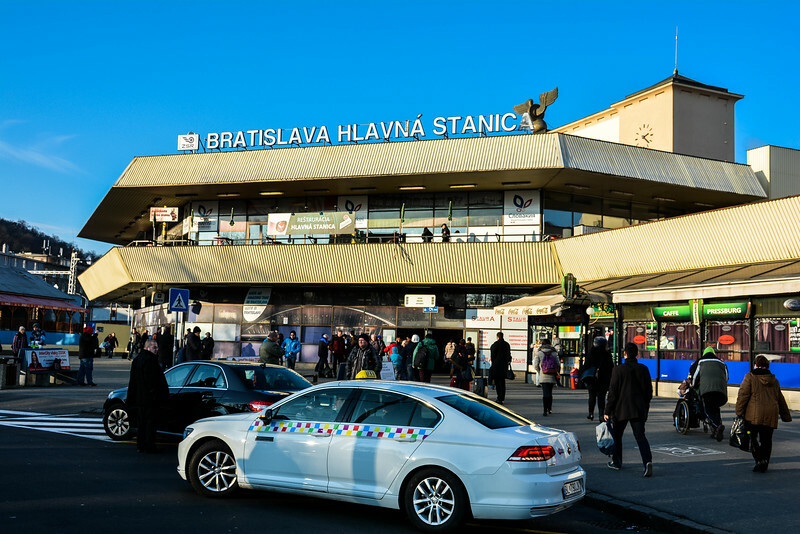 Arriving at Bratislava’s train station, we were immediately greeted with a large ‘Welcome to Slovakia’ sign and given the small size of the station we were still left a little unsure as to what we could expect during our visit to the city. 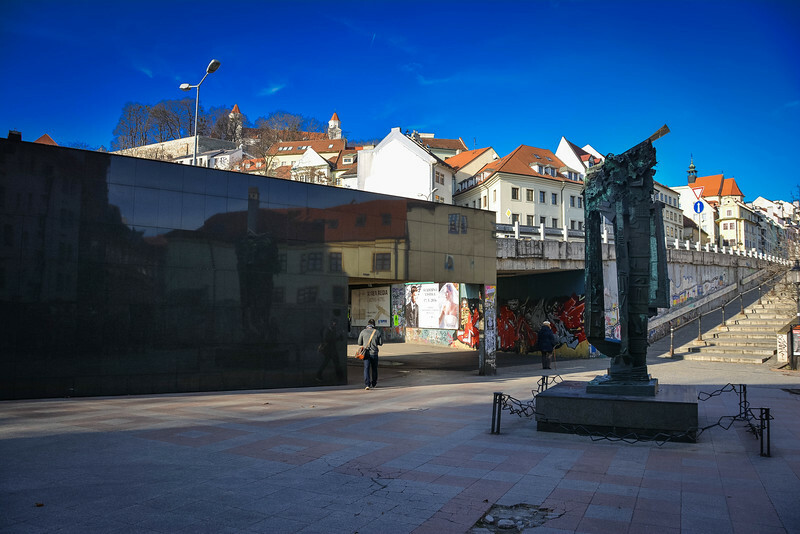 If you want to go to the city center, the best way is to take the X13 bus to “Namestie SNP” and from here you are one step away from the very center of Bratislava’s main square (Hlavne namestie). 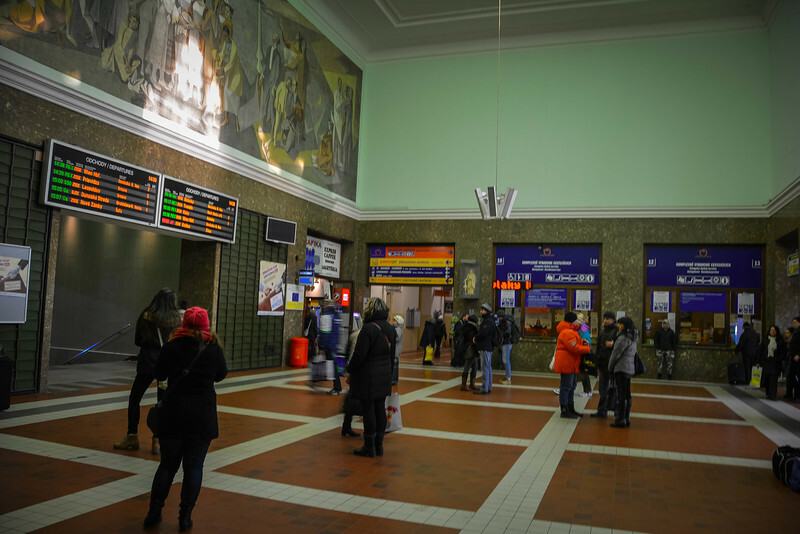 After establishing our bearings in the station and using one of the luggage storage lockers inside the station, we hopped on the bus and took a short 10-minute ride to the heart of the city. Leaving the bus, we immediately felt more confident and excited about what lay in store for us during the walking tour of Bratislava. So…spending 6 hours in Bratislava, what can you see? 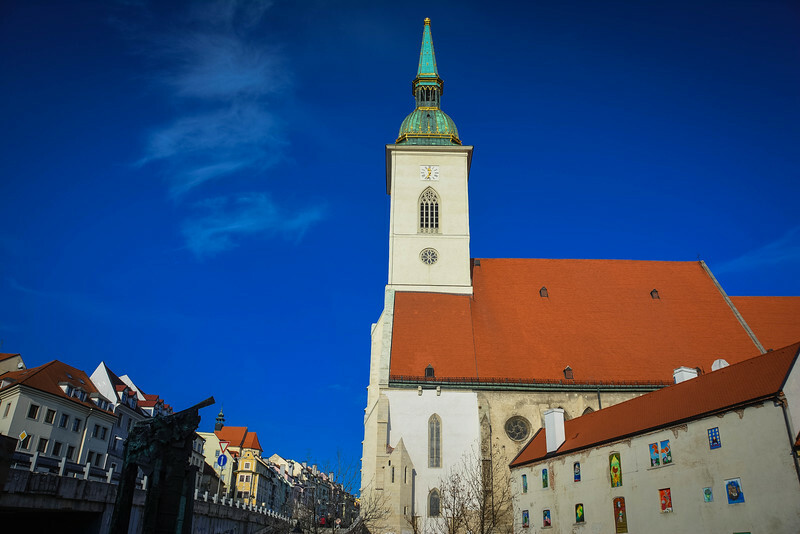 This is where the free Bratislava tour comes in handy because you are given a guided tour by a local Slovakian and taken to all of the hot spots in and around the city. 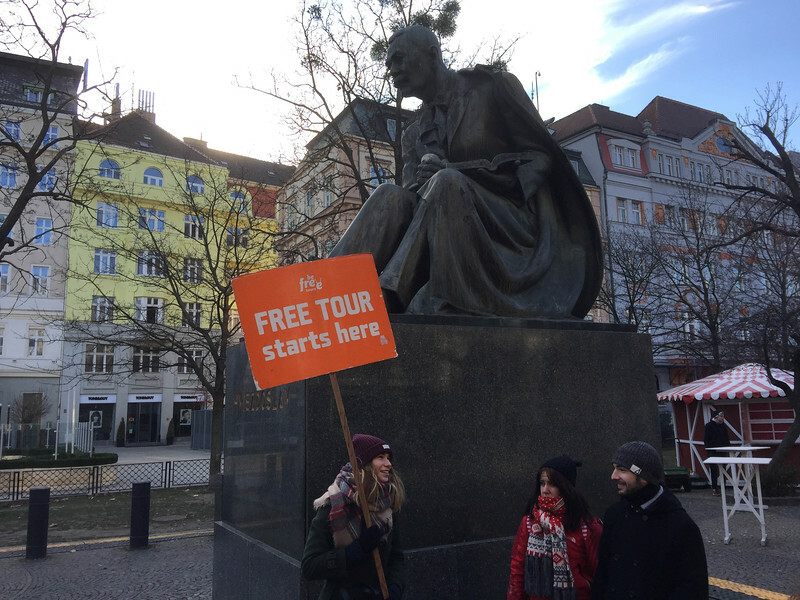 Thanks to Be Free Tours for offering this awesome 3-hour tour and special thanks to our tour guide Andrea for an informative and well-organized walk around the city. Tours are available in English and are offered twice daily at 11AM and 3PM. We opted for the morning edition on New Year’s Eve and despite the incredibly frigid conditions, the tour went ahead. 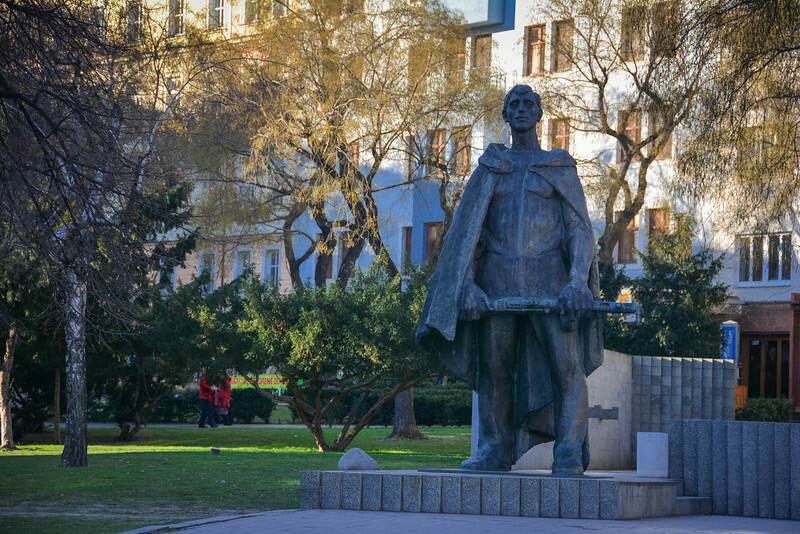 We met at the Hviezdoslavovo namestie meeting spot, also known as the Statue of Hviezdoslav, which is essentially located in the heart of Bratislava. Our guide gave us a quick summary of what to expect from the tour and just like other free walking tours around Europe, it works on a tip based system. The beauty of this is that each tourist is given the opportunity to pay the guide based on how informative and rewarding they think the tour is. This certainly encourages the guide to give a better tour so that at the end they receive better tips. Tips ranging from $5-$20 are standard but honestly you can give whatever you think is appropriate for a 2.5-3 hour tour of the city. Here is a quick guide to the top attractions in Bratislava that you can expect to visit during your tour of the city. The first part of the tour started in Bratislava’s main square where we met. 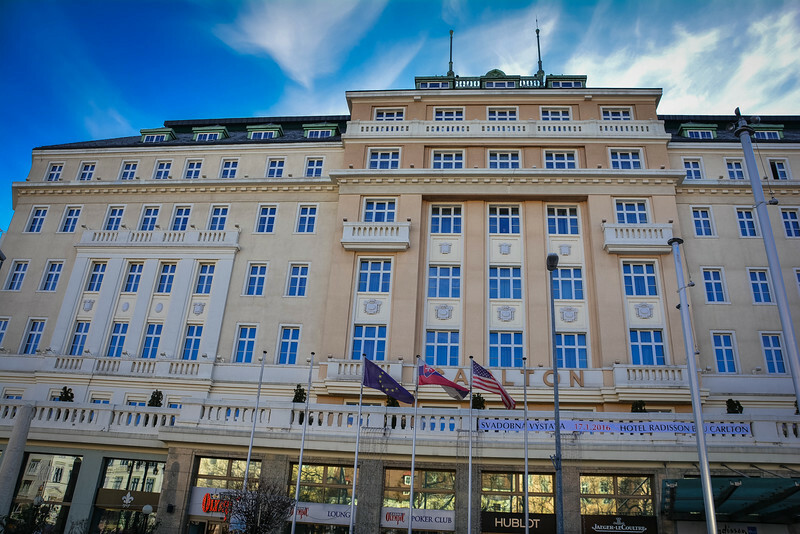 From the gorgeous, towering statue of Pavol Hviezdoslav to the Hotel Carlton that has housed many famous guests including Einstein, Nobel and US president George Bush. In 2005, President Bush gave a speech in Hviezdoslavovo Námestie alongside Russian President, Vladimir Putin. 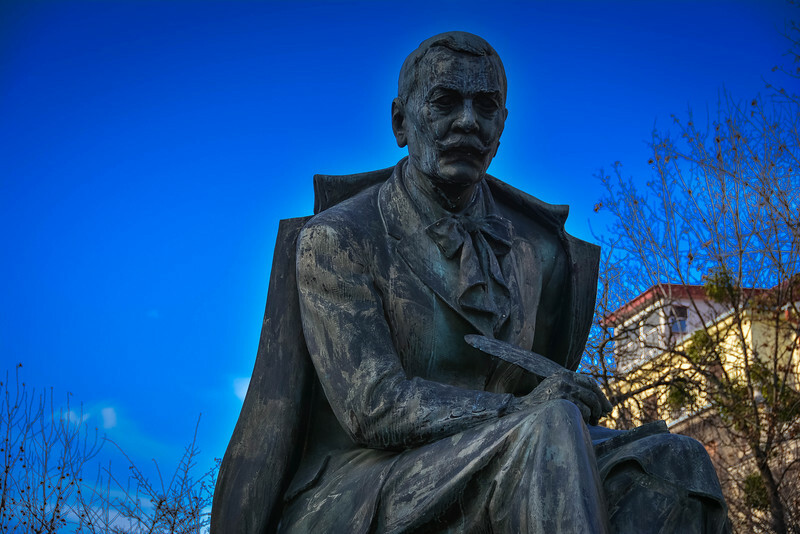 The iconic statue that I mentioned of Hviezdoslav relates to the Slovak poet who is a well-renowned figure in Slovakian history, and his values certainly relate well with the Slovak people hence the reason a statue was formed in his memory. As you peer around the main square, it is difficult to avoid seeing many other stunning buildings such as the Philarmonic Concert Hall (known locally as Reduta) and at the southern point is a statue of famous Danish author, Hans Christian Andersen following his visit to Bratislava and his claim that he loved this city (belief is that many of his stories were inspired from his visit to Bratislava). A short walk from Hviezdoslavovo Námestie led us to the imperious sight of St. Martin’s Cathedral. 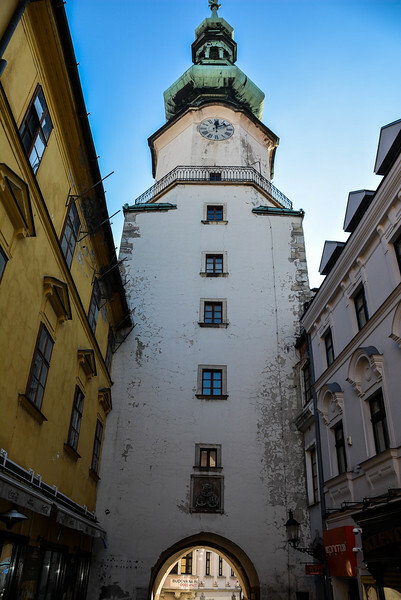 The traditional Gothic-inspired architecture is evident throughout this beautiful construction but perhaps the most impressive feature is the gold-plated replica of St. Stephen’s crown that sits on top of the tower. Weighing in at 330 pounds, of which 18 pounds is gold, this makes St. Martin’s Cathedral one of the most sought after attractions (and perhaps this feature is a reason why security is generally a little higher here, though I would hate to imagine someone trying to clamber to the summit of this tower). 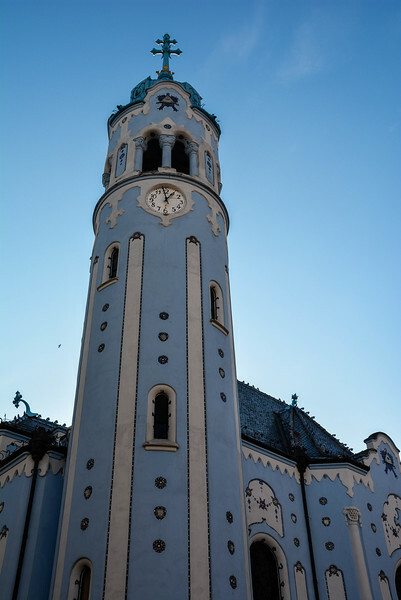 The towering spire stands proudly above Bratislava’s Old Town skyline and is in a perfect location for visitors to admire its beauty alongside the nearby Bratislava Castle which is a short walk from this point though the free walking tour does not head in that direction. Given that “The Watcher” almost lost his head on numerous occasions due to vehicles not paying close attention, there is now a road sign perfectly named “Man at Work” that accompanies this statue. It’s strange that this has attracted so much attention but I guess when you have something as quirky as this in the middle of a historic city, it’s going to get to get tourists stopping and snapping a quick picture! According to Andrea, legend has it that a wish will come true for you if you touch the head of the Watcher. Have you taken the time to touch this statue? Perhaps I will regret not doing so. 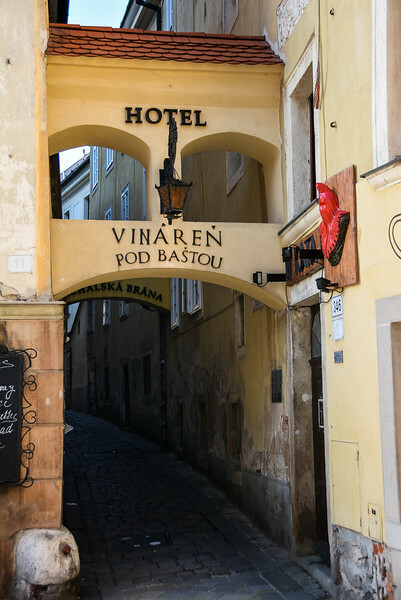 We headed into the historic, back streets of Bratislava’s Old Town and marveled at the gorgeous infrastructure and idyllic cobblestoned streets that typify an Eastern European city. Passing by buildings such as the Old Town Hall that date back to the 14th century and the Trinitarian Church of Bratislava really emphasizes how this city has preserved much of the rich history here. 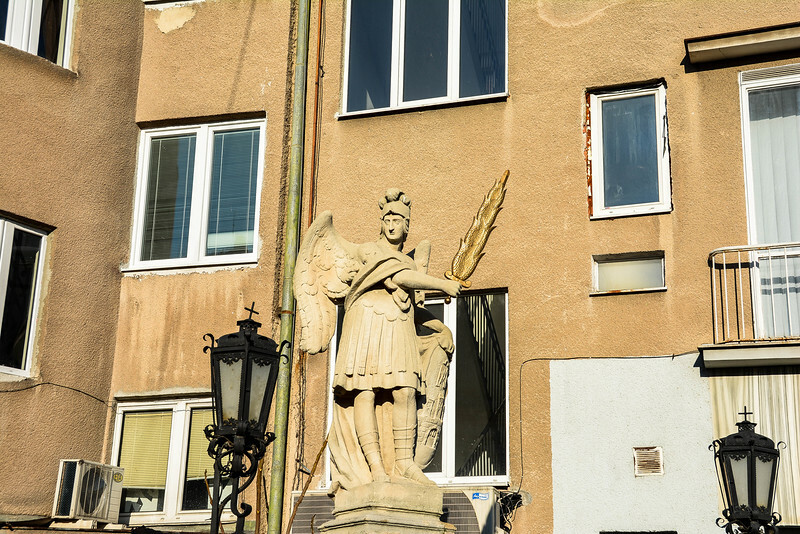 Remnants of Bratislava’s past are noticeable throughout the city yet there are signs of the city becoming a more modern city, especially when you look at architecture such as the Most SNP or more commonly known as the UFO bridge crossing the Danube River. Walking through St. Michael’s Gate is a really cool experience because as you look back down the streets it’s a gorgeous setting with local shops and restaurants making this a perfect spot to relax among a welcoming atmosphere. St. Michael’s Gate is the only entrance that has been preserved from the medieval fortifications and is ranked as one of the oldest buildings throughout the city, dating back to 1300. 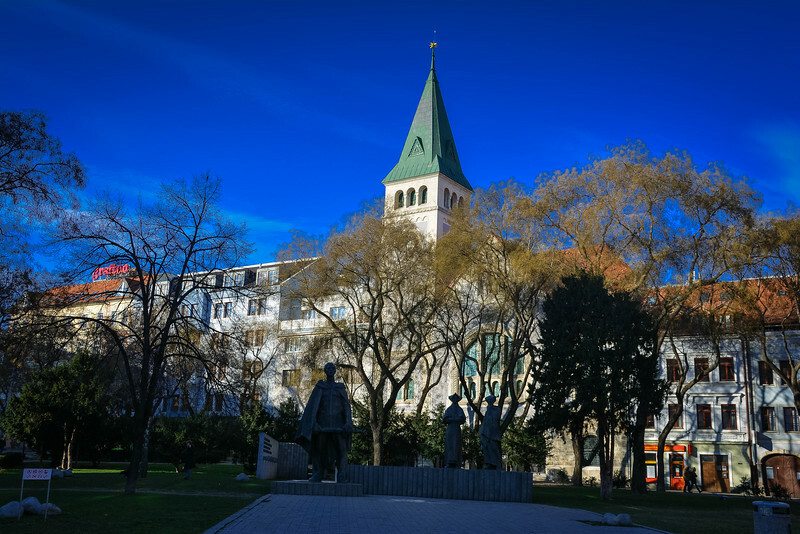 After taking a stroll out of the Old Town through St. Michael’s Gate and passing by the Grassalkovich Palace, the residence of the Slovakian president, we headed to another of Bratislava’s iconic squares – SNP Square. 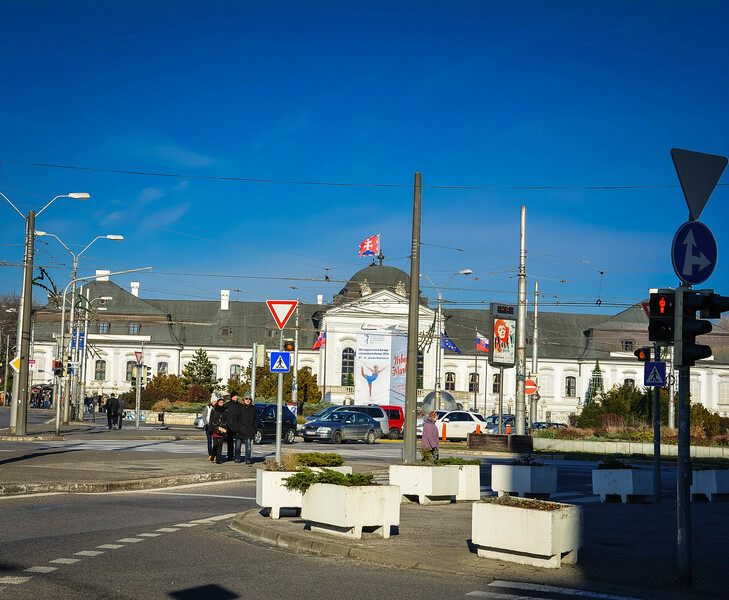 SNP Square is named after the Slovenske Narodne Povstanie (Slovak National Uprising of 1944) and is one of Bratislava’s largest squares, commonly used for concerts, public protests and celebrations, most notably when Slovakia became World Ice Hockey Champions in 2002. Andrea shared stories of Bratislava’s past at this point, one in particular, relating to the protests that took place here in the late 1980s during the Velvet Revolution which led to the transition of power away from the Communist party of Czechoslovakia to a parliamentary republic. It’s worth noting that you can find some of Bratislava’s best restaurants to sample some fine Cibulacka (onion soup) or Cesnacka (garlic soup) near SNP Square. 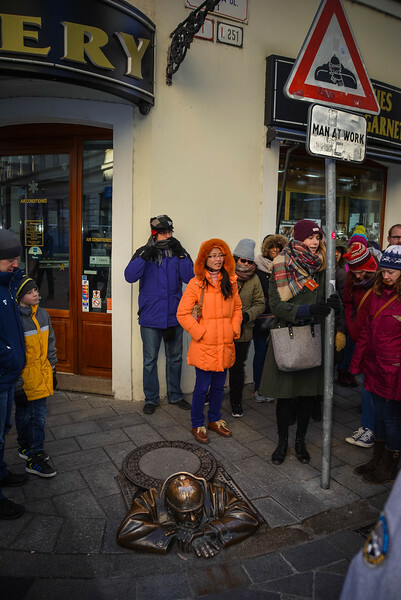 By the time we reached the Blue Church, over 2 hours into our tour of Bratislava, many of the folks in our group were clearly feeling the freezing cold temperatures. But we weren’t going to let this stop us from enjoying yet another of Bratislava’s gorgeous, yet peculiar looking attractions. 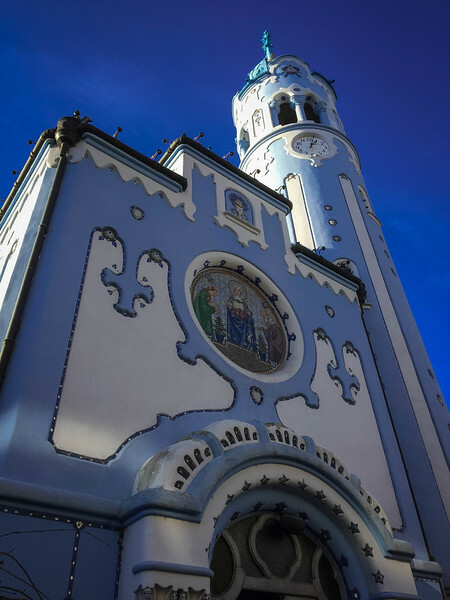 The Church of St. Elisabeth, commonly known throughout the world as the Blue Church, has a very Gaudi-esque look to it yet so it is no surprise to hear that this was designed by Ödön Lechner who was dubbed the ‘Hungarian Gaudi’. 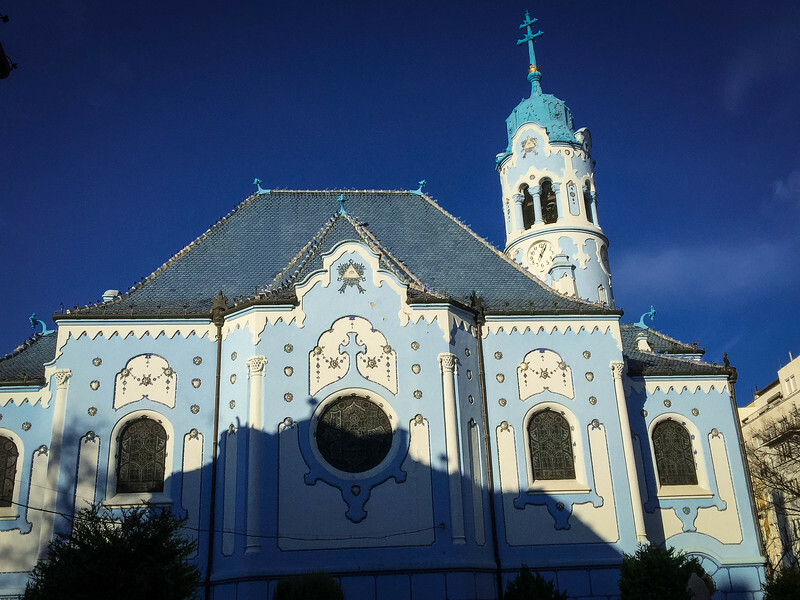 Located in a quiet part of Bratislava’s Old Town, the Blue Church is a typical example of Art Nouveau architecture and mass is still offered here regularly for locals and visitors who wish to experience the interior of this beautiful construction. 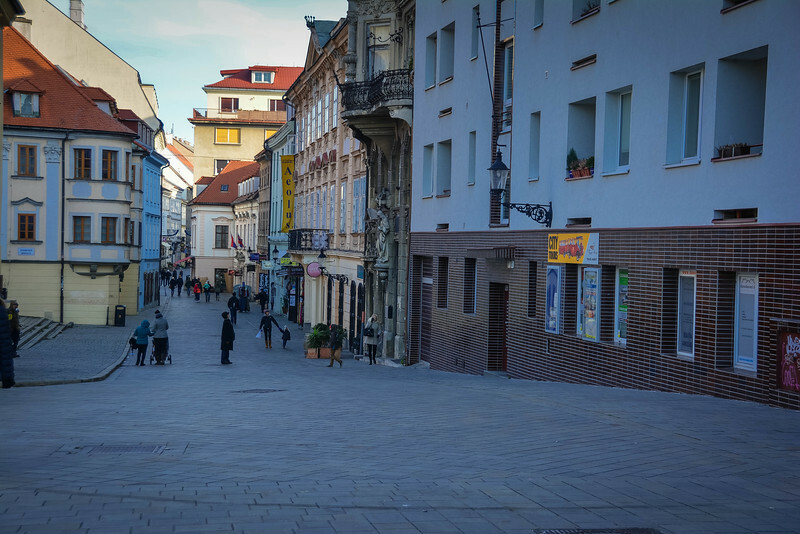 If you are interested in learning a little more about Eastern European history and want first hand experience of a beautiful city rebuilding, be sure to add Bratislava to your itinerary. 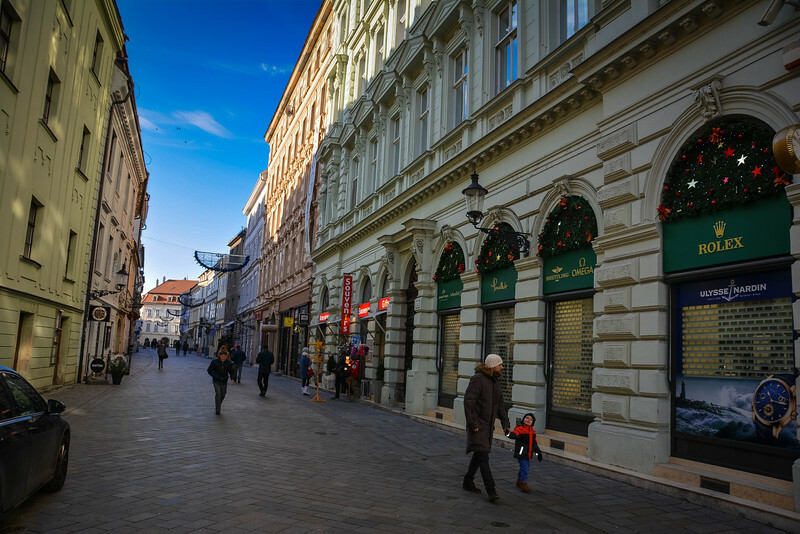 After experiencing the free Bratislava walking tour, we can attest that this is definitely the best way to see this city and if you are fortunate to have a guide as awesome as Andrea, your generous tips will certainly be justified. Bratislava is a city that we would both love to return to and perhaps use this as an opportunity to explore more of Slovakia. Stereotypes are there to be disproven and I think we have shown here that the negativity surrounding this nation is far from the truth. 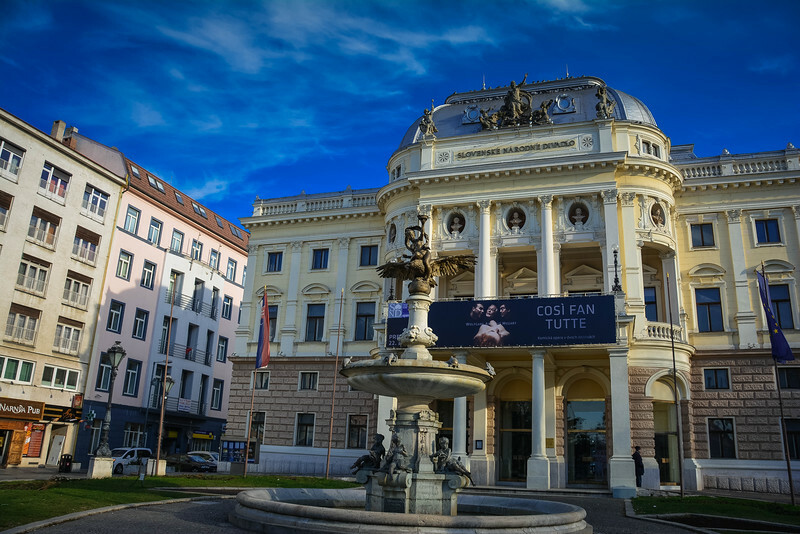 Don’t let false advertising shown in movies distract you, take some time to visit cities like Bratislava and you may be pleasantly surprised at what you discover! Next articleAmsterdam Walking Tour – Why It’s Epic and Controversial? You seem to have seen a lot during that short visit. It is nice to hear weekend others also enjoy Bratislava since a lot of people really are sceptical about going there. We lived in Bratislava for one and a half year and really enjoyed it. 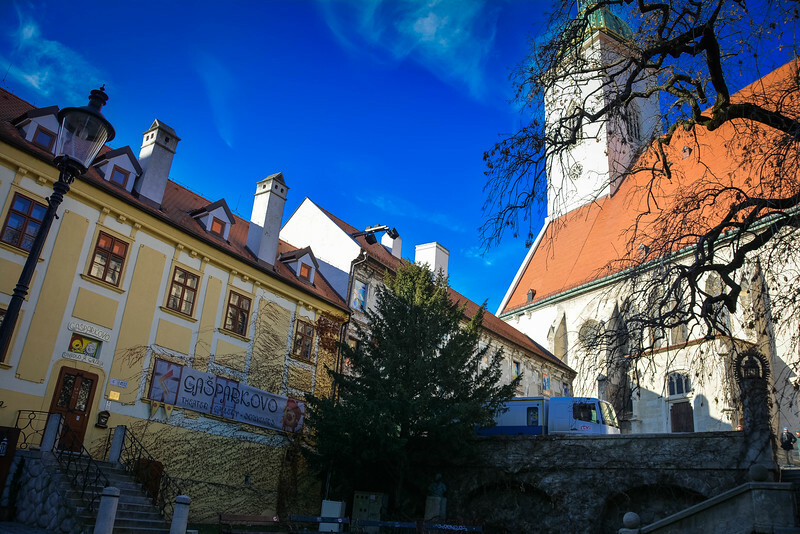 There really is a lot to see, not only in Bratislava but also in the surrounding towns. If you go there again, the I can really recommend you to see both the Devin Castle and the Slavin Memorial. There is also a really nice WWII bunker open for the public in Petrzalka just on the border with Austria. The border itself also got several of the cold war warning signs still standing. My colleague sent me the link cause she saw me on a pictures and it simply made my day. I remember your group from the New Years cause it was such a pleasure to have so nice company that day. Andrea, it is a pleasure to write about Bratislava! What a beautiful city and even though we only had a short time there, it was enough to know that we can’t wait to return. Your walking tour was awesome and you are a true credit to the city of Bratislava. Hopefully with people like you, more visitors can experience the beauty within Bratislava and perhaps the stereotype associated with movies like Hostel will disappear. 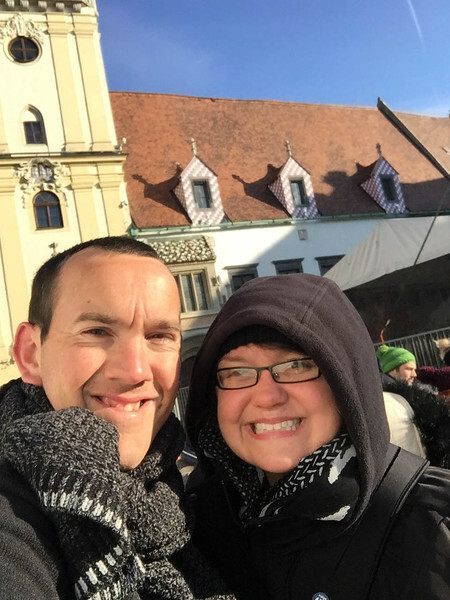 But if people choose against visiting Bratislava…well that’s their loss and only when you have the opportunity to experience this historic city do you realize just how amazing it is. I visited in 2014. I guees I have to go again. I visited Bratislava in the summer of 2016. We took a boat on the Danube from Vienna. We weren’t aware of the tours. Thanks for your photos, they bring back a lot of great memories. I would encourage others to visit. Which tour company was it? The tour company was Be Free Tours!